As most of you will remember, we will be trying a new format for our Fall Rendezvous. Input from club members has indicated a desire to try a less structured competition for the Fall Rendezvous which allows them to shoot with their friends rather than being regrouped. Member input also indicates a desire for more shooting opportunities (possibility of shooting in multiple classes). 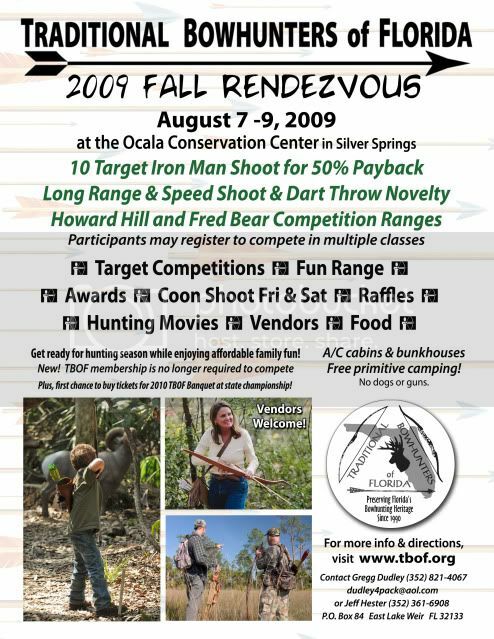 The competition round will consist of two 15 target ranges (Fred Bear and Howard Hill). A competition round will be finished upon completion of those two ranges. Score cards should be turned in upon completion and no later than 11:00 AM on Sunday. A shooter may compete in multiple classes by paying a separate competition fee. A shooter may also pay to shoot the course again with the same equipment, but may only turn in the score card from their first attempt. Shoot fees will be reduced to $15 per competitive round to accommodate the current economic conditions as well as acknowledge the shorter course. Remember too, that our complimentary shoot fee age has been raised to 17. The Fall Rendezvous is a perfect time to introduce a friend or young person to archery. Remember too, that membership is no longer required to participate in our shoots. We look forward to trying out this new format in August. As always, we welcome your input in this process. If it works we will adopt it as our Fall Rendezvous regimen. If it does not work we will modify it or return to our traditional forum. Novelties, Iron Man, Fun Range, and Raffle table as always!